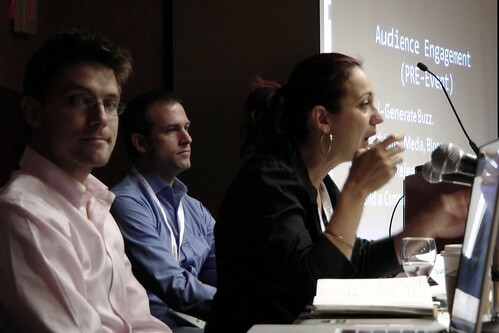 Giselle Diaz Campagna makes a point during the “Mobilizing Your Social Network” panel at BlogWorld Expo. One of the pleasures of working with nonprofits is seeing the evolution along the social media continuum — generally, from early skeptic to dabbler or explorer to enthusiast to evangelist. The latest convert who’s become a full-on, passionate evangelist advocating that nonprofits embrace social media is Giselle Diaz Campagna, development director of Free Speech TV. In September Socialbrite contracted with Free Speech TV to help the Denver-based nonprofit get a social media game plan together for the One Nation March on Washington on Oct. 2 and to prepare for coverage of the Nov. 2 midterm elections. We created a Quick Starter Kit, a 54-page Social Media Plan, a Planning and Assessment document and a Social Media Training presentation on how to galvanize people to support your cause. And while we generally don’t write about our consulting work on the Socialbrite blog, Giselle had some insights about what her team learned over the past two months that are worth sharing here. It’s important to note that Free Speech TV already had a social media presence on Facebook and on Twitter. What was missing was a way to integrate these efforts with its main site and its channels on the DISH Network and DirecTV as well as a strategy for turning outside stakeholders into allies and evangelists. I can’t go into the specifics of our recommendations, but the steps that Free Speech TV took in a very short time frame produced results well beyond their expectations and showed, once again, that you don’t need to have hundreds of thousands of fans or followers to make a big impact with social media. The overall approach that Free Speech TV took with its social media outreach during One Nation and the midterms can be summed up in one word: inclusiveness. Recounts Giselle: “What I learned was that when you’re telling a message to your constituency, the minute you start introducing other voices who are interacting with your brand, immediately the message starts proliferating. When you start helping other people deliver your message, immediately you don’t sound like the typical Facebook marketer. “It’s all about taking a step behind your name and disappearing. Because ultimately the network has to be theirs, it has to be them talking about you. When you’re willing to surrender your cause to your allies, that’s when you proliferate. You need to surrender it and still keep QA in the background” to make sure nothing is going awry. 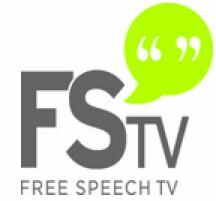 Free Speech TV followed our advice and assigned only two people admin roles on Facebook while instructing its staff and interns to “go in and share, share, share” using their own personal accounts and identifies, Giselle says. That worked perfectly, creating the specter of a vibrant community. FSTV’s social media efforts leading up to the Nov. 2 midterms produced an even bigger bonanza than its One Nation effort, Giselle says. she collaborated with programming partners in New York (Democracy Now! and GRITtv), Washington, D.C. (Thom Hartmann and Marc Steiner) and their FSTV Denver headquarters, relaying questions to the anchors that were pulled from user posts on the partners’ Twitter and Facebook pages. Also during the satellite programming, FSTV ran crawls asking viewers to send their Twitter/Facebook questions to be discussed live. Their intent, Giselle says, was this: “If you’re watching our TV coverage, we want you to open your laptop and take part in the conversation.” (Love that.) Once the hosts began reading users’ questions on the air, the questions began to pour in via Facebook and Twitter. While the word synergy has lost all meaning, it’s certainly true that FSTV’s integrated efforts paid off. “That kind of integration is where we’re heading,” Giselle says. Free Speech TV’s use of social media has gained the nonprofit new viewers, and they’re now creating a strategy to channel that attention and energy into “constituency and funding so that we can use them as conduits and broadcasters,” she says.